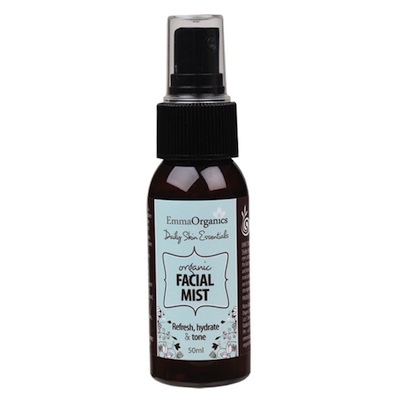 Emma Organics Essential FACIAL MIST is a daily hydrating mist to restores and hydrates the complexion and is ideal for use at any other time your skin needs a "pick me up". ACO Certified Organic. Free from parabens, sulphates, phthalates, colours, animal derived ingredients, formaldehyde causing agents. Purified Water (Aqua), Organic Aloe Vera (Aloe barbadensis) Juice, Organic Coconut (Cocos nucifera) Water, Coco Glucoside, Parfum (Natural Preservative), Pink Grapefruit (Citrus paradisi) Essential Oil, Organic White Tea (Camellia sinensis) Extract, Organic Cucumber (Cucumis sativus) Extract, Organic Ylang Ylang (Cananga odorata) Essential Oil, Citric Acid, Organic Olive Leaf (Olea europaea) Extract, Sandalwood (Santalum album) Essential Oil.